Be honest now–who among us did not, at one time or another, dream of being Cinderella? I know I did–to suddenly be transformed from an awkward adolescent with quirky hair, bad skin, and a full metal jacket of braces, not to mention oddball interests like classical music and old books, into a smooth-haired beauty who was kind and gracious to boot, seemed like the ultimate transformation. All without any particular effort on my part, of course. 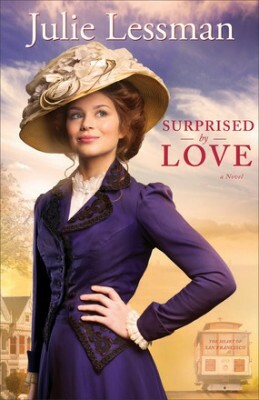 In Julie Lessman’s new novel, Surprised by Love (#3 in the Heart of San Francisco series), set in early-20th-century San Francisco, Megan McClare has always been a shy, awkward child, mocked by classmates, until she returns home from a year spent in Paris. Who is this beautiful butterfly who has shed her ugly cocoon? With her sights set on a professional career, Megan begins working at the district attorney’s office with none other than Devin Caldwell, the meanest of the mean boys from her past–and the secret object of her affections. (*Sigh*–isn’t that always the way?) How is she supposed to work alongside him every day with all these conflicting feelings tumbling around within her? As she’s done her whole life, Megan tries to lean on her dear friend Bram Hughes–but what’s this? Bram is no longer the good buddy he’s always been–now he’d like to be her beau. But–but–Oh, dear, what a pickle! I have only a couple small quibbles with this book. One is the stereotypical emphasis on fixing physical flaws–I know that’s a central element of the plot, but some of the things Megan had “fixed”–her freckles for example–are not universal signs of ugliness. I, for one, find freckles absolutely charming. And how much better to be able to see, with the help of thick lenses, than to do without? Also, once in a while, the believability factor is stretched to its limit. A lot can happen in a year–but a complete transformation in which close friends and family claim to not recognize you? Seems a bit of a leap. Nonetheless, fans of Julie Lessman’s highly entertaining brand of romantic inspirational fiction, as well as ugly-duckling transformation stories, will fall in love with Surprised by Love.It might help to read the first two books in the series (Love at Any Cost and Dare to Love Again) to get the lay of the land before reading this third book. Disclosure: I’ve been given a review copy of this book by the publisher. This generosity, while appreciated, has not biased my review. I also post some of my reviews on Amazon and Goodreads.